I’ve heard most people come to the consensus that 2016 wasn’t exactly the best year – and if you were an older celebrity, you’d have been pretty darn lucky to make it out alive. I’ll admit that 2016 wasn’t a great year for me. But it ended with one final blow – to George’s hair line. Location, location, location – of course, it couldn’t be on the back of his head. Yep, the poor kid now has alopecia. And we’re hoping it’ll stop at the one spot, but only time will tell. The doc wanted to treat with steroids, but apparently having a few injections to his scalp didn’t sound all that appealing to my little man. He declined to cooperate. So we’ll try again another day. He wasn’t impressed with the day as a whole. We are on track to get some blood work drawn, so we can make sure there isn’t anything else going on…because that’s how we roll. Something simple snowballs into something more complicated and then all of a sudden you end up at Mayo having a world-renown doc tell you that she’s never seen anything like it before. Not that that’s happened before or anything. And really, what are the chances that could happen twice. So here we go – down the road of wait and see. At least it’s a familiar path. And I’m much more patient now. Did I just hear you laugh? I’ll keep you posted. And if anyone has any tips or tricks, let me know. It’s been awhile since I’ve updated on George’s story. And for those that have been following along, you’ll be happy to know that kindergarten has been going great! We’ve only missed 9 days so far, which in George’s world is pretty remarkable. And only once was it a pretty serious illness…but no hospital stays. We had a check up at Mayo in October. The pediatric neurologist is amazed with our progress. She cannot believe how far he has come. 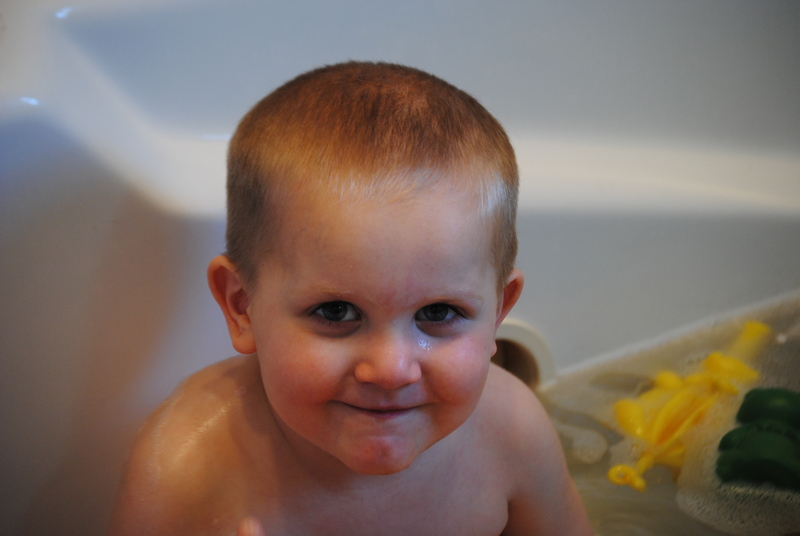 We had a repeat MRI and the gaps in his brain that they have been concerned about have not grown any. Some serious miracles here, folks. Science and God…together. Every day at Mayo, George would stop and say the Pledge of Allegiance to this flag. He’s one amazing little kid. The last two weeks have been a bit more difficult. George has had some tummy issues that we can’t quite figure out. 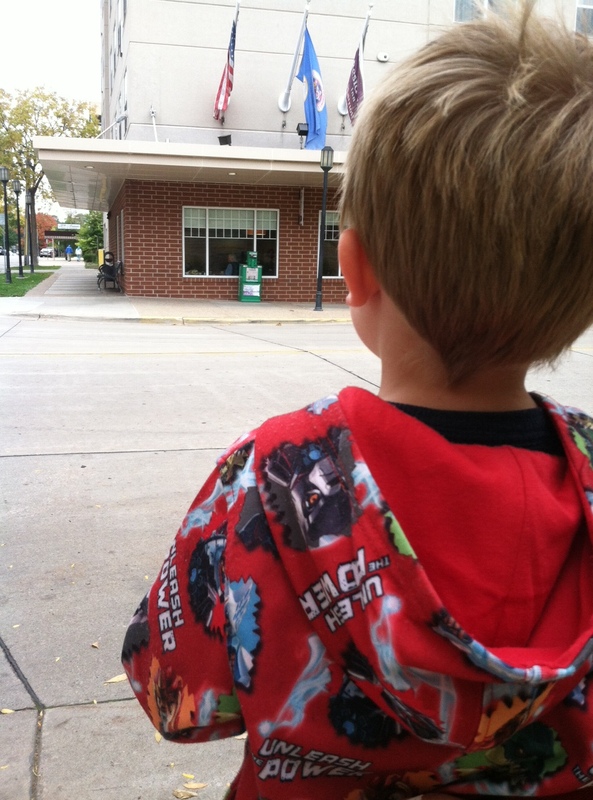 We’ve had an ER trip, a few docs visits…and it seems to be getting worse, not better. But we were able to get in to see a doctor this afternoon and we have a plan – and for some reason I always feel a little better when we have a plan. And if things aren’t looking better by Friday, well, then we are looking at another plan. 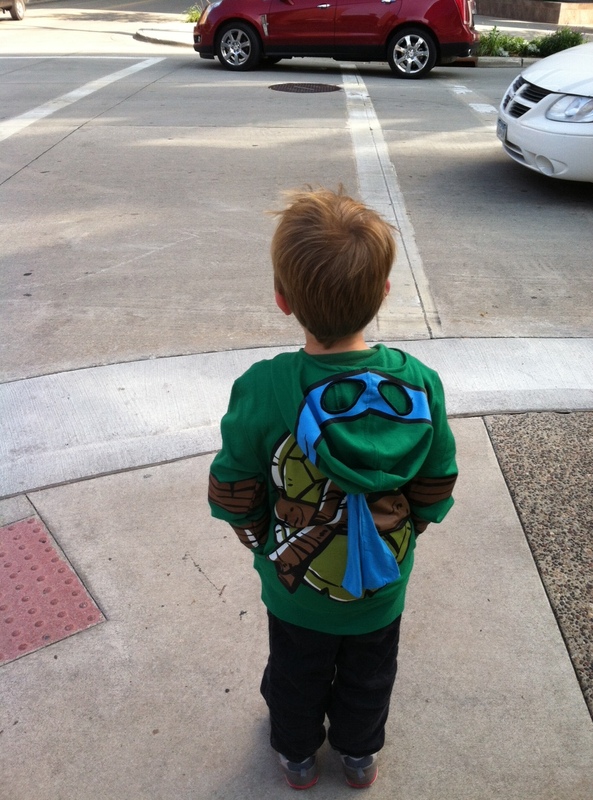 On day 2 at Mayo, George wore his Ninja Turtle sweatshirt. One doctor came up to him and shook his hand, and told him it was a pleasure to meet a real super hero. George is definitely MY super hero! But with everything that has been going on, I’ve become a bit difficult. A little sensitive. Sleeping less. Needing more. Just not myself. I’ve lost a bit of my focus. And then tonight, it all came sharply back into focus. George was sitting behind me in the suburban on the way home. Today I had woke up late, managed to get the kids ready, worked, had rearranged schedules so I could squeeze in a doctor’s appointment for George, drove 45 minutes to the appointment, then back for two parent-teacher’s conferences, listen to my 10-year-old explain how a schoolmate had told him that he’s growing too fast that he’s going to die, talk to him about bullying and coping techniques, went to a book fair, gave my son some meds…and we were finally on the way home. I didn’t know how…or if…I should respond. Why was he asking? Was he having dreams? Had he been hearing me talking to his doctors at Mayo? Had someone else been talking near him? I couldn’t say a word. My 5-year-old made me speechless. I sometimes get so wrapped up in the minutia of life…and I forget the big picture. And then George will say something and it will be like God tapping me on the shoulder, reminding me that in the grand scheme of things, the destination is much more important than the scenery along the way. I do not know how many more tomorrows George has ahead of him…nobody knows how many tomorrows they may have. Yet I know that George faces a few more obstacles than the average person. But he faces those obstacles with more bravery and courage than I could ever muster. Technology. I used to hear that word and think of gadgets and gizmos and the latest and greatest in whatever field you’re looking at…including agriculture. But not too terribly long after George joined our family, I started looking at technology in a different way. 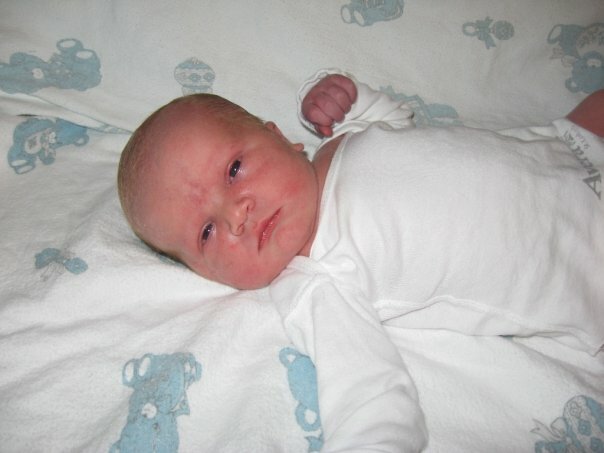 My 9-pound-13-ounce George, this picture was taken at the hospital when he was born. Little did I know what the future would hold. It’s not just about finding easier ways to complete the same jobs. Nor is it about finding ways to play God. Sometimes technology is simply about saving lives and improving the quality of life for those that are here. And that’s a hard lesson to learn. 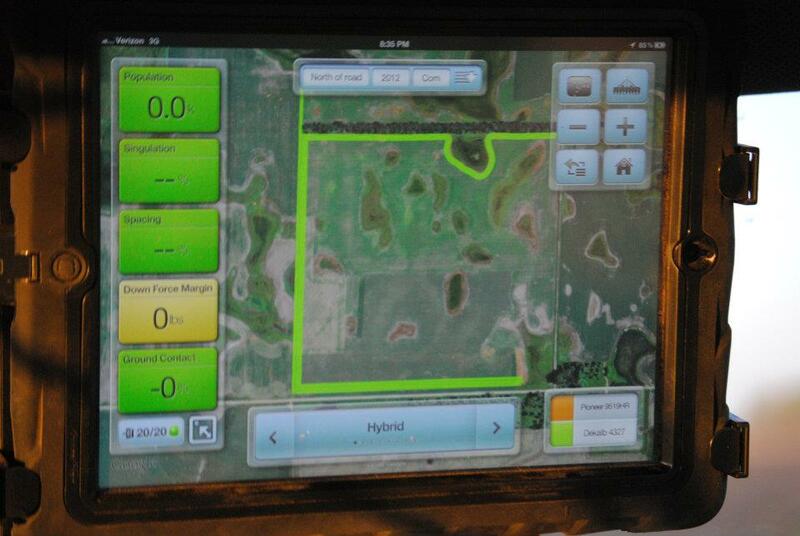 An iPad in the tractor cab, connected to the planter. Yes, technology can bring great improvements to efficiency! Here’s where I get personal: Had my son been born a mere two decades ago, I am guessing that I would probably be a mother of three. Not four. That’s a sobering thought. Technology and advancements in medicine have allowed him to not only survive, but to thrive and far exceed any of the expectations that we were given. Even by Mayo’s standards, George is amazing. George, summer 2010, before we had a plan in place. This picture sometimes makes me cringe…wishing I could go back and cheer myself on…pushing harder. But you know what they say about hindsight. When there are advancements in medicine that saves lives and improves the quality of life for hundreds, or thousands, or millions, we shout from the rooftops and celebrate! As we should. Yet, those same scientists…those same doctors…those same hands…they can follow the same methods, the same protocols, the same regulations and red tape and years of hard work and trials…but if those advancements are made in our food – well, the reaction is quite different. Are they not achieving the same goal? 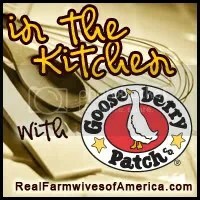 Does it not improve the quality of life for others if our food is more nutritionally sound? Does it not save lives if we are able to grow crops where crops always failed before? Does it not make a difference if the diseases in plants that used to destroy thousands of acres can be eliminated? If we were to find a way to eliminate cancer, would we not celebrate? Yet if we find a way to eliminate a plant disease…we protest? I’m not saying there isn’t a difference. And I’m not saying that we don’t need to look at technology with a cautious eye and we need to carefully and judiciously move forward. But do not tell me that using technology is not natural. Let me tell you what is not natural…having to carefully watch what your 4-year-old eats is not natural. Explaining to the parents of his classmates about his condition is not natural. Relying on a powder to provide your basic nutritional needs is not natural. But burying your child is also not natural. This is the George that we know and love…he just needed a little help getting to this point. We sometimes slip, and it’s not all roses, but that smile and those eyes make it all worthwhile. I realize that my exposure to technology is vastly different from most people. And for that, I am grateful. I have traveled down a road that I wouldn’t wish on anyone. But right now we’re on the other side, and it’s pretty sweet. And I thank technology and science…and God…for that. Lately I’ve been doing a lot of reading and research regarding our health, diets and how our choices influence it all. It’s been fascinating to learn so much more about our society, but when I read claims that our agriculture methods are creating problems, I tend to raise my eyebrows a little bit. Now, don’t get me wrong…I completely agree that cropping methods and systems have changed in the last few centuries. But shouldn’t we expect them to? I know of no other industry where people criticize innovation so blatantly. But again, that’s their right. Here is my unofficial synopsis of all the reading I have done: Perhaps it’s not only the crops that have changed, but our expectations of health. Our quest in life is to “feel good.” If we don’t feel good, we try to figure out why we’re not feeling good…and in doing so, we keep hunting down causes until we find something to blame. We are a culture of excess. We want to have our cake…and eat it to, even if it has to be gluten free. Will we reach a time in which all of our nutrition will come in compact form? 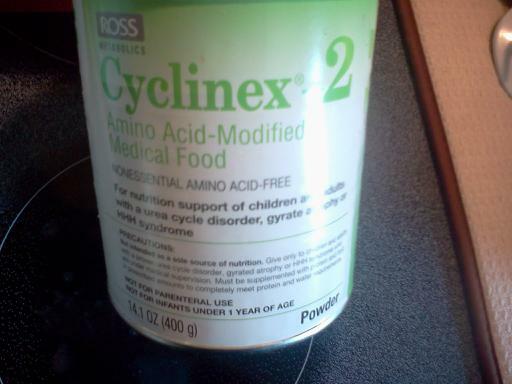 People clamor that these are new diseases, new allergies, new problems with digestion. But I wonder, are they really? And I’m not talking about true allergies, the kind that risk your life when in contact with triggers. Or true diseases, the kind that cause bleeding and excruciating pain and life-threatening consequences. I know all about those. It’s hard to believe how far he’s come, but the long road was worth it! My grandmother would tell me stories about when she was growing up. She had her appendix removed when she was a little girl and it terrified her. She was afraid that what she ate would make her ill, so she was very selective for a little while. Food made her ill, so she cut back on what she ate. Simple as that. She didn’t go to a doctor, she didn’t expect a pill would make her better, she didn’t question her choices, she just limited them. And no one was the wiser. Now we expect answers. We expect to “feel good” and when we don’t feel good, we expect that there’s a pill, a medicine, a cure, to make us feel better. In general, we do not suffer quietly and self-adjust our diets to make up for it, as our ancestors did. We enroll the help of medical professionals, we make it their job to find out what’s ailing us, and find some way to allow us to continue the same behaviors that made us ill to begin with…it’s mind-boggling truly. Looking back through our family history, I am pretty certain that George’s OTC is not new to our family. It just happens to be the first time that it could be diagnosed. And we were blessed when it was discovered…completely by chance. His diet changes are necessary, and life-saving, as is the case for many across the world. I have no doubt that watching what you eat, being aware of how your body reacts and adjusting your habits as needed is a great tool for everyone to use. But are we taking it too far? Just last night I heard two young girls talking in a store. One was buying gluten-free items, the other replied, “I didn’t know you had celiac?” She quickly said, “Oh, I don’t, I just read that it’s better for you. You know, more natural.” I had my oldest child with me, so I didn’t interrupt, but…ugh. What will be the next epidemic? I vote for common sense. How about you? It’s been a crazy few days…in ways that I can’t even begin to explain. We couldn’t get to church this morning because Boss Man returned from his uncle’s funeral at 2 this morning, and I stayed up to watch cows so he could sleep. I took a few moments this morning for myself and did a little thinking, I guess some would call it reflecting, maybe others would call it meditating. I’m reading a book called “99 Ways to Raise Spiritually Healthy Children,” by Kathleen Long Bostrom. It’s not my usual reading fare…but any time I see something that I think will help me be a better parent, I’m game to read it. The first two pages went straight to my heart…and I know I’ll be hooked for the other 98 ways (but I’ll only read them one chapter per day, so I can soak in the information). The first thing the book tells me is that you should forget about being a “perfect” parent. Instead, work on being “pretty good” or “good enough.” The term that they use that spoke most to my heart? Be a perfect parent for your child. This chapter came with three things to always remember: 1) Remind yourself that you’re only human. Let go of mistakes and missed opportunities. 2) Recognize things that you can’t control. Go with the flow. 3) Remember the big picture. You’re not in this alone, and believe in grace. You ARE a good parent, you just can’t base your judgment off what others think. You can’t use someone else’s ruler to measure your worth as a parent. So stop doing it. Why does this speak to me so much? I don’t think these words would have stopped me so completely this morning, had it not been for our youngest son – you all know him as George on this blog. Before George was born, we knew that he was trouble. At 13 weeks pregnant, I became very, very sick and ended up having an emergency gall bladder removal. The risk of the surgery to his survival was pretty high, but the risk of leaving it in was high as well. We moved forward, and he showed a great amount of resilience. My right kidney gave me all sorts of trouble, and we finally got to the answer during the final weeks of my last pregnancy. I have a twist in the tube that goes from my kidney to my bladder, and pregnancy would close off that twist…blocking my kidney and causing lots of pain. Stents were painful as well, so I tried my best to make it as far as I could. He had a few hours of trouble with breathing, but nothing major. I spent a few extra days in the hospital because of problems with my cesarean. George and I left the hospital with a clean bill of health. But that bubble didn’t last long. Late-onset jaundice, troubles gaining weight, something that seemed like colic, but not…finally I gave in and went to the doctor, but our regular doctor wasn’t in. Blood work, lab tests. We left the clinic with promises of phone calls with answers. The clinic is an hour from our farm, so I took advantage of the time to get a few groceries and other items not available in our small community. My skinny, tiny little boy. My heart. Something told me to check our home voicemail. We received a message from the doctor himself, asking for me to return his call ASAP. (I don’t know why they didn’t use the cell phone number I gave them.) I did, and received the news that we needed to get to the hospital. We were being admitted. What was wrong? It seemed like everything. Nothing made sense. Off-the-charts liver enzymes, critically low blood sugar, etc. There were more lab tests with flags than normal. 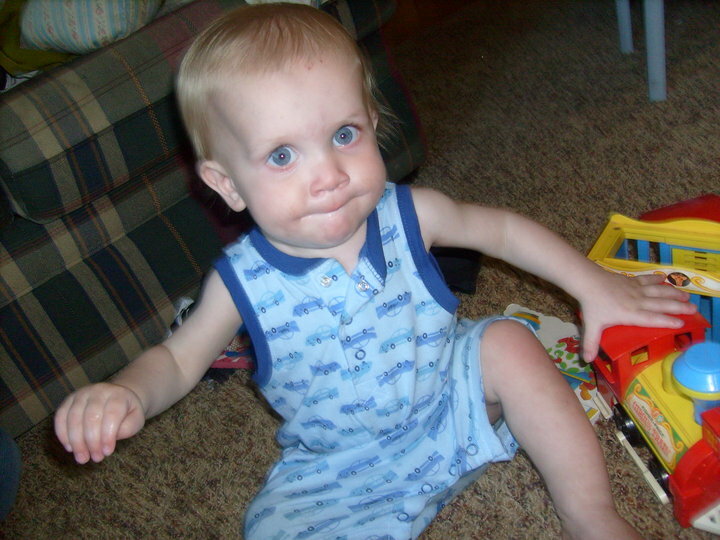 And we didn’t have a clue what was going on…he was three months old. Who can deny this determination? Meet all of your challenges head-on. That began a whirl-wind of appointments, specialists and 18-months not knowing what was going on. I pushed and pushed…knowing somewhere there would be an answer. Failure-to-thrive is a symptom, not a diagnosis. Finally, the fourth physician that was involved at Mayo (or maybe sixth? seventh? I lose track.) came up with a long-shot. Ornithine transcarbamylase deficiency. (You can check out the OTC tab on top) Yes, spell check, I know that’s spelled right. I’ve had to spell it many, many times. Low-protein diet, tons of doctor’s visits, extreme caution with illnesses…it’s been a crazy ride. 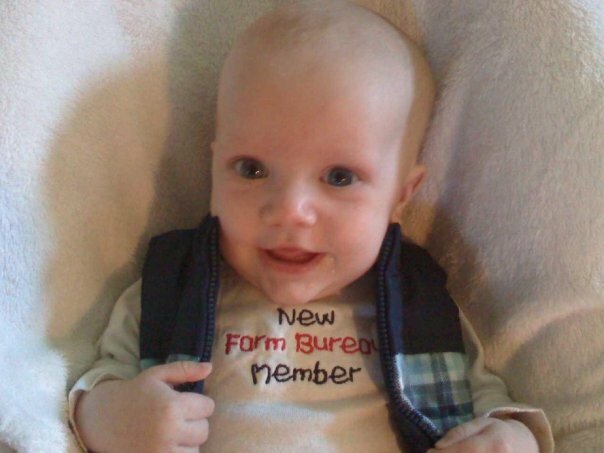 Imagine, a rancher’s son living the life of a vegan – yet stricter. But the payoff? Weight. Curiosity. Growth. Imagination. My son. I have NOT been a perfect parent. But I have been the perfect parent for my son. 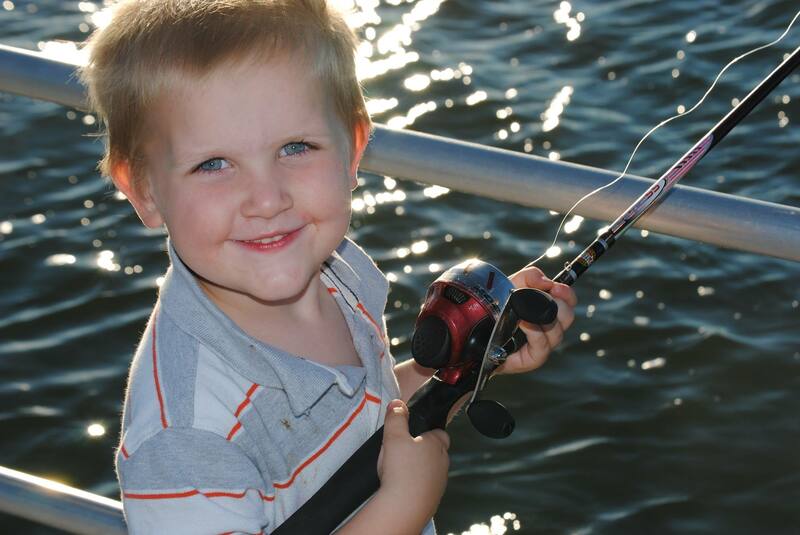 According to science, my son isn’t expected to live to see the age of 5. He’ll be 4 in April. 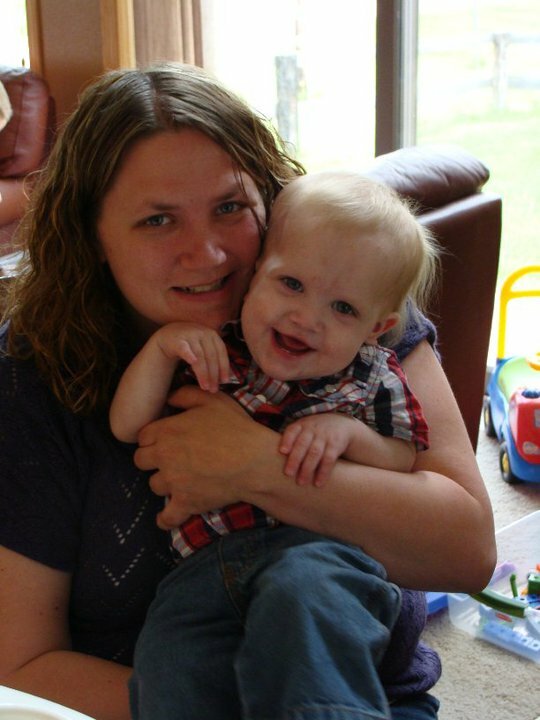 According to science, my son should have developmental disabilities. His MRI shows the gaps where his white matter should be. 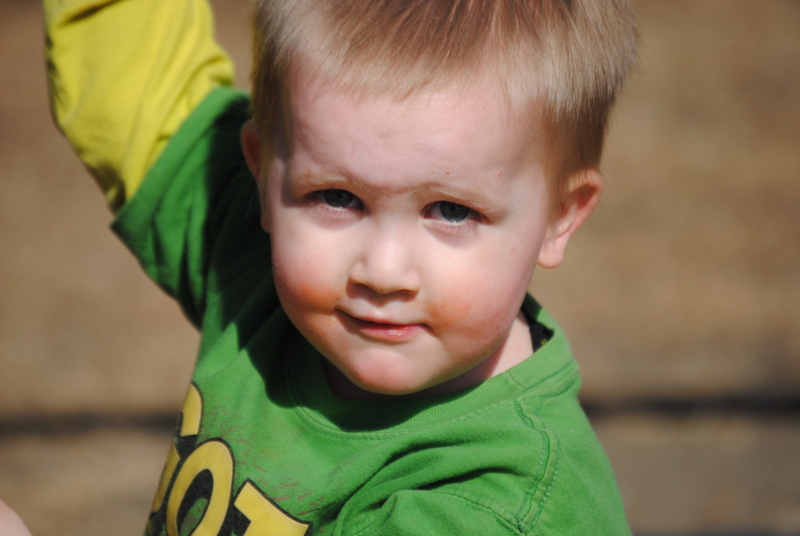 He’s an extremely intelligent little boy who knows all his letters, colors, numbers and shapes. He has started adding and subtracting and can read simple words. According to science, he should be sickly and weak. He hasn’t been in the hospital since last year at this time. According to science, he shouldn’t be growing. His blood work shows that he produces no measurable amount of growth hormone. His pituitary gland is small and malformed. Yet he weighs 42 pounds and has grown three inches this year. We are beating odds and blowing away science. And we won’t quit pushing. No, I am not a perfect parent. But I am perfect for my son. And he is perfect for me. Trust in the Lord with all your heart, and do not rely on your own insight. In all your ways acknowledge Him, and He will make straight your paths. It’s hard to believe that it’s been 3 years. Three long, crazy years that I was never sure we’d make it through. George, summer 2010, before we started his low-protein diet. With his skinny little chicken arms, tiny legs and minus any fat. The beginning of October is the anniversary mark of our trips to Mayo in Rochester with George. Sometimes I find myself staring in those big, beautiful eyes of his, and I am amazed at where we were and how far we’ve come. How will we celebrate such an anniversary? Well, with a trip to Rochester, of course! Actually, we’re pretty lucky because our trips are now down to twice a year (barring any bumps in the road). So, as we prepare for another series of doctor’s appointments, please keep George in your prayers. Things have gone so well the last several months, I’m just hoping and praying for continued good health and no hiccups in his blood work. 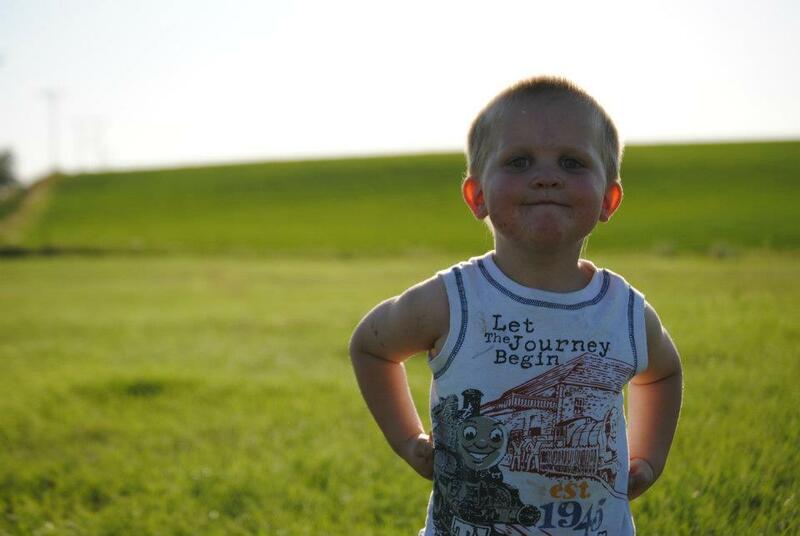 George, summer 2012 – all sass and attitude! Full of life, love and a true blessing through and through! It’s been a long road, but you frequently find the best trips are the ones that take awhile to get there. Right? Whooping Cough. I never used to think much about it. Along with chicken pox, influenza, measles, etc. It was all just stuff that I didn’t worry about. My children were vaccinated, and if they still managed to catch something, well, they’d recover and be no worse for wear. That’s no longer my way of thinking. Ever since George has blessed our home, I’ve become terrified of outbreaks, even of the simplest of illnesses. Because with George, nothing is simple. So what made this all come up now? I saw an article in a Montana paper about the whooping cough outbreak there. Montana. It makes my stomach hit my throat. For those that aren’t aware of geography, or aren’t familiar with the Upper Midwest, Montana borders North Dakota on the west side. Yes, we’re on the east side, but so many people (even local people) are traveling from western North Dakota to eastern North Dakota that I don’t believe it will take long at all for the epidemic to hit our state. And that is cause for concern. During our last trip to Mayo, our team decided that with the circumstances in our area being what they are, that we should go ahead and have George fully immunized. (Up to this point, he was only immunized with those vaccines that were not derived from a live virus.) This is both a blessing and a worry at the same time. I feel blessed, because this will mean no longer having to wonder whether or not we should venture out. Well, at least it alleviates the concern quite a bit. I’m worried because the days following the vaccinations will be stressful at best. It wasn’t a hasty decision to fully vaccinate. There are concerns and risks involved…but the risks can be carefully monitored and better controlled when you know what could be coming, instead of being blindsided. For example, if George were to be exposed to chicken pox, it would take up to two weeks before we would even know that something was truly amiss. The “pox” do not show up until the disease has already been in your liver, and George’s liver is already an organ we don’t want messed with. So what do you do? You take the known risks and have a plan. Must we, with the photos Mom? All the time? But before we can get to that point, we have to get George over his cold and make sure he’s as healthy as can be. And in a house full of boys, that’s not always an easy task!